Although NASCFC remain unbeaten in the league this season, Sunday’s performance left a lot to be desired after such a good opening start to the campaign. With a number of key players missing for this game against The Three Crowns, the Sports Club went into this game on the back of three straight wins, still hoping to make it four against the side propping up the league table. 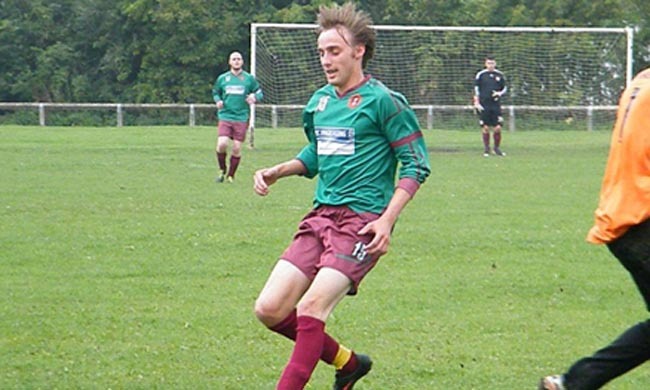 After a very sluggish start, which saw the Three Crowns with most of the early play, the opening goal was scored by top goal scorer Chris Jones (pictured above) on the 15-minute mark. A deep cross from the right hand side saw the ball land at Jones feet and after a quick moment to get the ball under control, he managed to find the back of the net at the second attempt. This saw the home side raise their game again and it wasn’t too long before the equaliser came, much to the joy of the home fans and sideline. With the half drawing to a close, it was Chris Jones again who managed to weave through the solid defence line and slot home a second to make it 2-1 at half time. The second half started much as the first with the play being broken up in midfield with a period of sloppy passing from both teams, but eventually, and for the fourth game in a row, Jones secured his hatrick with a neat finish past the keeper, to put The Sports Club comfortably in the lead. However, The Three Crowns then decided to spoil the party by catching goalkeeper Stephen Richardson off his line and lobbing him for 30 yards to make it 3-2 and back in with a shout. Sports Club then had a number of chances, the best coming from a Tom Postle header which struck the bar. With less than 10 minutes left on the clock, NASC’s slopping passing in the centre of the park yet again caught them out and a quick break saw the home side with a clear run on goal to slot pass the goal keeper and to draw the game level. A late push from the Aycliffe side saw a few chances go begging, glancing the cross bar again from a corner, but it was all too little too late and NASC FC had to make do with a draw. Team: S Richardson, J Clegg, A Gittins, G Boyes, C Little, M Alder, T Watson, C Hughes, P Cook, D Jose, C Jones (3). NASCFC are currently looking for Match Day Sponsorship from local companies, if interested please contact Paul Eales (07535591614) for more details.